SCORM stands for Sharable Content Object Reference Model and its main purpose is to set the standards and specifications (with one word compliance ) of interoperability of the content used for electronic educational purpose. Learning Management System is the software that allows to create, manage and track training programs, mostly web-based using guidelines (SCORM). 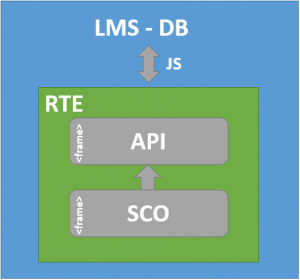 This 8 functions must be provided from the API in order for the training course to communicate with the LMS.